Being a teetotaler, I... don't get beer. Like, have you all actually tasted it? Whoof. I mean, there's things like Code Red in the world. So, in a fantasy setting is pretty much the only place I'm going to be dealing with the stuff. 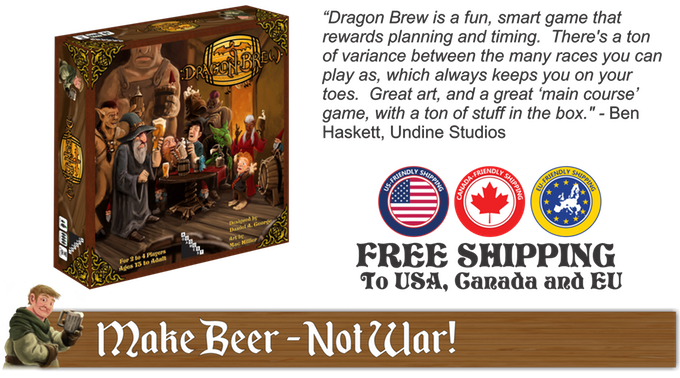 Thankfully, there are games out there that can let me live out that part of life, such as Dragon Brew, a new one up on Kickstarter. Dragon Brew takes place in the fantasy kingdom of Brumancia where years of war and conflict have been replaced with competitive beer brewing. Each player chooses a fantasy race, each with its own unique ability, and takes on the role of a head brewer maintaining peace by winning prizes at the annual DragonKeep beer festival. Players build brewery estates by generating gold to expand their brewery, harvesting grain and exotic ingredients, researching new recipes, and brewing fantastical beers. In order to earn the top prize, and the victory points that go along with such prestige, players must adapt their recipes to the ever-changing preferences of the beer festival judges. The winner of the game is the player with the most victory points at the end of three game years. The Kickstarter is above their funding goal with still 11 days left on the clock.